View of “Hermann Nitsch: DAS ORGIEN MYSTERIEN THEATER,” 2018. 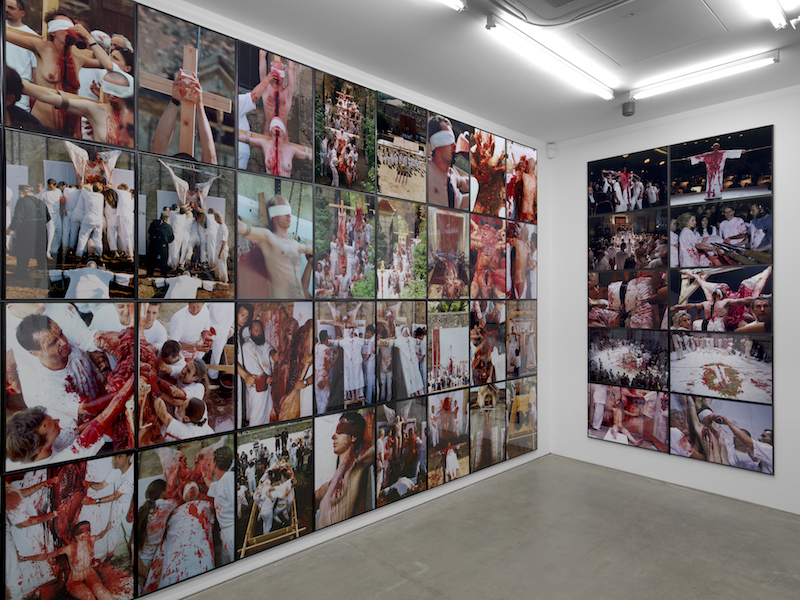 Hermann Nitsch, one of Viennese Actionism’s principal and last-surviving members, has been making his visceral and ceremonious work for decades. His art dives into the heart of human history and experience, plumbing its excruciating depths while celebrating its most ecstatic heights. The artist’s show at Massimo De Carlo in London, which runs through May 25, 2018, outlines the artist’s DAS ORGIEN MYSTERIEN THEATER performances, spanning almost sixty years. Here, Nitsch talks about the London show and the core philosophy of his work. 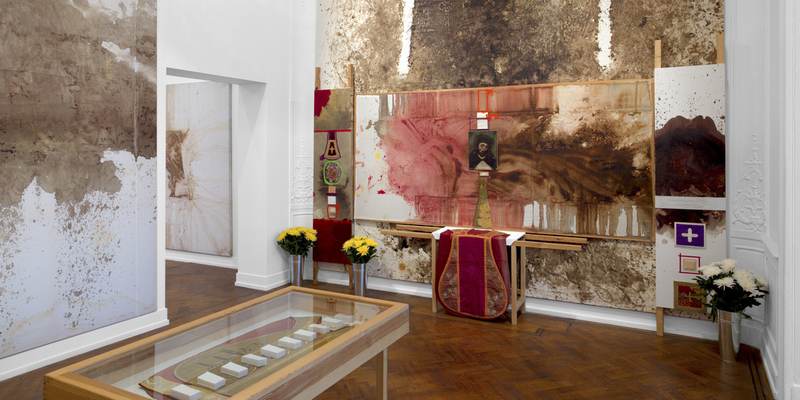 MY LONDON SHOW, at Massimo De Carlo, features different types of work: action paintings, relics of actions, videos, and photo-documentation of the DAS ORGIEN MYSTERIEN THEATER events throughout the years. There is also a special installation that showcases my Gesamtkunstwerk and the idea of synesthesia: you can “hear” colors, “see” sounds, and “taste” performances. In 1998, in Prinzendorf, Austria, I performed the main component of DAS ORGIEN MYSTERIEN THEATER for the first time—it’s called Six-Day Play. There were five hundred performers and thousands of people in the audience. In 2020, I am going to realize Six-Day Play again—it might be the most intense version of the work yet. Sensual experience and living to one’s fullest are the basics of my theater. The involvement of color, blood, meat, intestines, carcasses of slaughtered animals, and naked human performers happens ritualistically. The piece, of course, is a work in progress; it is never finished. I have done many of these performances over the years, all over the world. I hope to learn more from this new iteration—especially with the music, as it will be much more important this time around. The music of DAS ORGIEN MYSTERIEN THEATER has continued to develop over the last fifteen years. It’s become more complex and sublime, even with the music’s archaic, excessive clamor and ecstatic noise. The music’s cosmic organ sound has become increasingly important. Please understand that I have no desire to explore “magic.” I am interested in philosophy and depth psychology. The theory of the collective unconscious and the concept of the archetype developed by Carl Jung are crucial to my kind of theater. I want to understand mythology through depth psychology. And I don’t believe in a particular religion, either. However, each religion brings its own sort of message, and I respect that. I want the people who participate in my theater to develop their egos in relation to the self. The “I” is the self, deeply embedded and connected to the entire cosmos. My theater causes the “I” to open the doors to the self—it engages all the senses. An artist must be radical and intense in his work; think of Vincent van Gogh, Edvard Munch, or Francis Bacon. That’s not merely a question of our time, right at this very moment. This has been true throughout the entirety of art history. My work conveys every shade of emotion: love, anger, ecstasy, and even pain. The history of art, after all, has always celebrated pain; think of Greek tragedies or the Passion of the Christ. Matthias Grünewald’s Isenheim Altarpiece from the early sixteenth century is a very important work of art for me. It speaks of death and resurrection, which are vital aspects of my art. I am engaged with finding being. When you find being, there is first death, then resurrection. Admittedly, this kind of intensity is difficult to describe in words. But I do not mistake this particular kind of intensity for shock. Shock is related to mass media. Intensity goes much further and deeper than shock. Intensity relates to catharsis; through catharsis, one reaches a more purified space of consciousness. The catharsis theory was originally defined by Aristotle. Catharsis comes from experiencing fear and compassion in Greek tragedies. Where unconsciousness was, consciousness is. I have no interest in “shocking” people through my work. Antonin Artaud, a great man of theater, expanded upon Henry Becque’s “Theater of Cruelty.” If you understand Artaud’s vision, you will then understand the way I create theater. I try to educate the audience with my theater, to help them find their own existence, their own being. Do I think art can save people? For sure. It saves them from being lukewarm.